The Original Father and Son Restaurant opened its doors at the corner of Diversey and Whipple in 1947. As true pioneers of pizza delivery, business flourished throughout the 50’s. 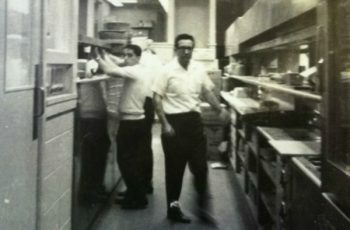 As a result, in 1963 Father and Son moved to a much larger location in Logan Square at 2475 N. Milwaukee Avenue. Finally with great pride, Marcello’s was opened in Lincoln Park at 645 W. North Avenue and in Northbrook at 1911 Cherry Lane. 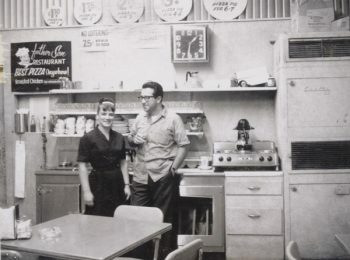 After 70 years, the third generation of Bauer’s continues to own and manage all locations! Our restaurants take great pride in serving “made from scratch” family recipes with only the finest of ingredients. While always recognized for the best thin crust pizza and broasted chicken in Chicago, over the years the menu has been expanded to include a variety of delicious flatbreads and sandwiches, upscale salads, creative pasta and chicken dishes, as well as seafood. The Father and Son restaurants have always been committed to offering an excellent and consistent menu at reasonable prices. As an added bonus, ample free parking is available at all restaurants. Each location offers its complete menu for delivery encompassing the entire Chicago metropolitan area and combined, makes a staggering 8,000 to 10,000 deliveries per week. Drop-Off catering menus are also available at each location and are designed to accommodate groups from 10 to 1,000 people. Marcello’s a sister company of Father and Son Enterprises, includes a contemporary and inviting dining room, private party rooms, a cocktail lounge and gourmet bakery in Chicago and Northbrook. Marcello’s homemade from scratch bakery creations are available in our dining room as well as on delivery and include everything from cookies and brownies to gourmet truffles and specialty cakes. Also don’t miss out on our Gluten Free menu items as they were developed by the Father and Son team, it beats all the competition. In addition, Marcello’s offers off-site catering ideal for any special event. From theme parties to lavish carving stations, family style or plated dinners, Marcello’s offers a diverse selection of delicacies at the venue of your choice. Our catering team has been privileged to arrange special events ranging from 50-2,000 people for CBS Television, The Mayor’s Office, United Airlines, The Chicago Archdiocese just to name a few. Marcello’s, A Father and Son Restaurant will satisfy your craving at our house or yours!